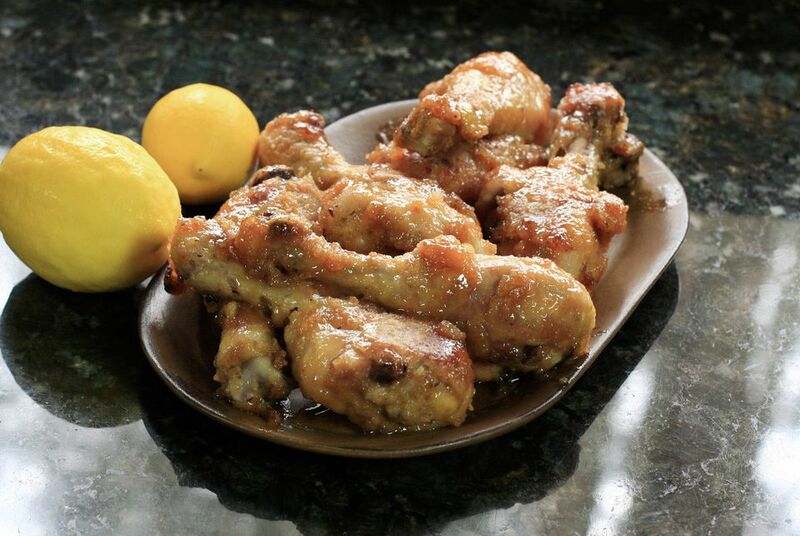 These delicious baked chicken drumsticks are coated with a mixture of lemon juice and honey, along with seasonings, a little soy sauce, and brown sugar. Serve these flavorful chicken legs with mashed potatoes and a side vegetable, or double the recipe and make them for a party or game day snack or lunch. Pat the chicken drumsticks dry with paper towels. Toss them in a food storage bag with the flour and Creole seasoning. Melt butter with olive oil; pour it into a shallow baking dish. Arrange the chicken drumsticks in the baking dish, turning to coat them thoroughly with the butter mixture. Bake the chicken in the preheated oven for 30 minutes. In a saucepan over medium heat, combine the honey with brown sugar, lemon juice, and soy sauce. Stir to blend and bring to a simmer. Pour the honey mixture over the chicken pieces and return them to the oven. Bake for 30 to 40 minutes longer, turning the chicken pieces every 10 to 15 minutes.